If you are at least level 12, you will see a pop-up inviting you to the Legends of the Farmdog Trail Event. 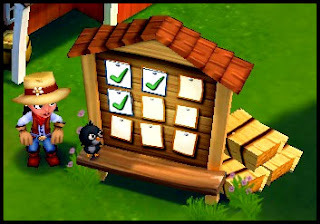 Please note that you will need to reach level 14 to unlock Phase 3, and level 18 to play the final phases 4 and 5.You have until January 22 to complete the Legends of the Farmdog Trail quests, and win Jack Pennyfeather as a temporary Farm Hand. Raisins - Visit Grandma's Glade, Pappy's Pond, Merryweather Mine, or Pier. All over! We're introduced to Jack Pennyfeather. He explains who he is and what he does. Click on the 'Let's Go!' button to continue. Surprise! We're not awarded experience but a freebie key. Good start, Zynga. Our next reward is a barn padlock. Unless you're storage is maxed these always come in handy. I'm astonished. No quest experience here either. I'm starting to take back my comments about Zynga succumbing to the lazy bug. Good job, you've earned a barn nail. Here's a nice new feature. When you finish your quests for a particular phase a nice little scene will appear before it moves you to the next phase. Seems to me that we are on the hunt for a rare yeti. The first phase is now over. Get ready for the second!